Miracle Workers Auto Collision Center has just equipped its collision facility with the new i5 Pro Spot Computerized Resistance Welder. This welder is the first of its kind in Nebraska. 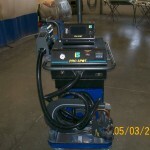 This welder is fully computerized and equipped with all of the OEM specifications to duplicate the manufacturer’s assembly process. It measures, senses, and then welds every time regardless of metal, thickness or type. Miracle Workers Auto Collision Center continues to stay above the rest with our advanced tools, equipment, and updated training. This allows us to serve our customers with the most advanced collision repairs in the area.